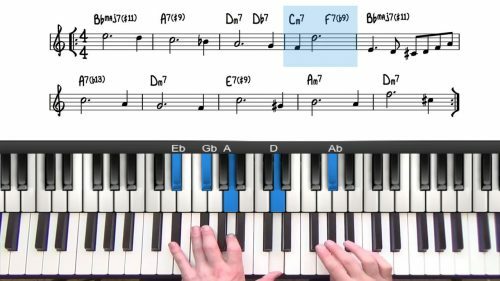 In this lesson we’re going to create a solo piano arrangement for the tune “My Favourite Things”. The tune is written in ¾ so it’s played with a waltz feel. We do interpret some of the tune quite freely, in particular in the introduction and the ending. I’ve drawn inspiration from 2 different areas and styles. Firstly the Bill Evans solo piano recording is a great place to start with this tune. He makes great use of the different registers of the piano which you will see in this arrangement. I’ve also absorbed some of the style and phrasing of contemporary players such as the jazz prodigy joey alexander and his brilliant rendition of this tune. We apply lots of quartal voicings and rehamonisations which give parts of the arrangement a fresh and modern sound. 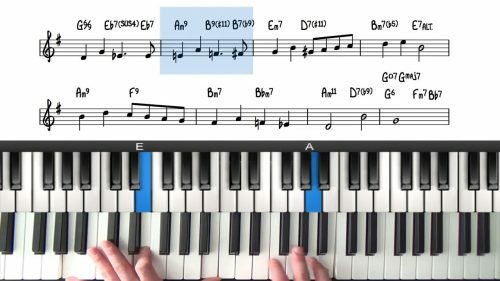 This lesson demonstrates the options available to bring interest to simple or repetitive chord progressions. First we look at the minor line cliche which always sounds great over minor chords. Next we look at moving the inner voices of the chord by taking the 5th up to the #5, then to the 6th and finally to the minor 7th. Also look out for melody lines that move up the notes of a scale, this gives you the opportunity to harmonise the line with the diatonic 7th chords of the key. 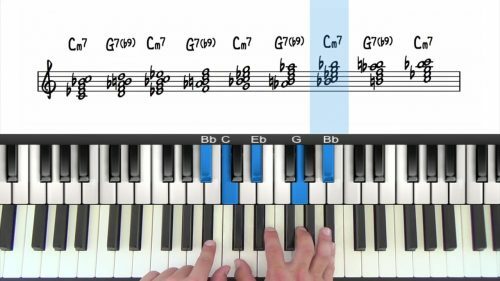 In this lesson we demonstrate this with diatonic drop 2 voicings.